Are you a standard player thinking of switching to EDH? This week my article is aimed at standard players who want to give commander a whirl or commander players who want to give standard commander a try. Standard commander is just what it sounds like. You build a commander deck except you are restricted to cards that are currently legal in standard. If someone was new to commander wouldn’t they just want to buy a C13 preconstructed deck? I think if someone plays a lot of standard and draft, breaking into the format by making a deck with their existing pool of cards is the best choice. Why go out and buy a preconstructed deck with cards they may never play with again? Read on to see my Vorel standard commander list as well as my break down of the pros and cons of the format. 2. A fun challenge: The greatly reduced card pool presents a fun deck construction challenge, and also makes the decks easy to build since most players at a shop have plenty of standard fodder for trade. 3. Balanced power level: If everyone is playing standard commander the games tend to be more evenly matched since the power level of the decks is going to be fairly consistent. This also usually leads to longer games which some people enjoy more. It’s rare that someone is going to be blasting off the launch pad in the early game. 4. Room to grow: When standard rotates you don’t necessarily have to scrap the deck like you would most likely need to do with a regular competitive 60 card standard deck. You could always adapt the deck to fit the new standard card pool. 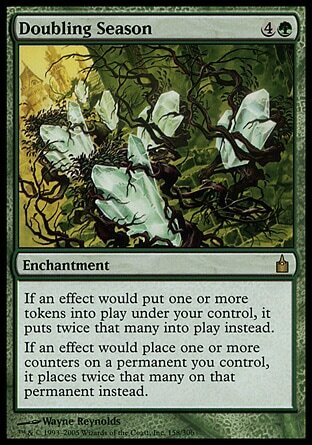 Alternatively you can just turn it into a regular commander deck by including all of the other little gems from Magics vast card library to transform the deck into one that will see regulator rotation in your stable of decks. 1. Longer games: The power level of decks is going to be fairly even and will most likely lack the massive finishers that you may be accustomed to. For this reason the board can stall out from time to time, which will lead to longer games. If you don’t enjoy longer games, this can be a disadvantage to the format. 2. Deck Similarities: Since the card pool is so small if you build a standard Obzedat, Ghost Council deck and your friend also does, there is going to be a lot more card overlap than if you were using the entire card pool available to regular commander decks. Luckily there are a lot of legendary creatures to choose from in standard at the time of this writing, so you most likely won’t have to use a duplicate commander. 3. Combo is Hard: If you love combo decks, they become much harder to build only using a standard legal card pool. There are some janky combos lurking out there if you look hard enough, but if this is your prefered playstyle you might be a little disappointed. There is still plenty of synergy to please Johnnies, but going infinite will prove to be a bit trickier than usual. For my deck I chose Vorel of the Hull Clade because I love doubling things and there are plenty of cards in standard right now that support +1/+1 counters. Vorel won’t have the fast start that a Boros deck would have but if you can survive the initial onslaught there are some pretty big plays he can make. 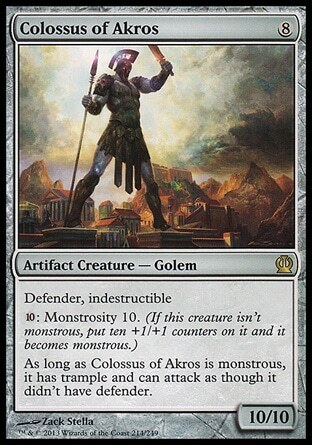 Colossus of Akros: You really want to get this guy out with Vorel. If you manage to ramp with cards like Gyre Sage and Karametra’s Acolyte you should be able to cast him without too much trouble. If you live the dream and go monstrous with the Colossus and then target him with Vorel you have a 30/30 trample indestructible win condition. 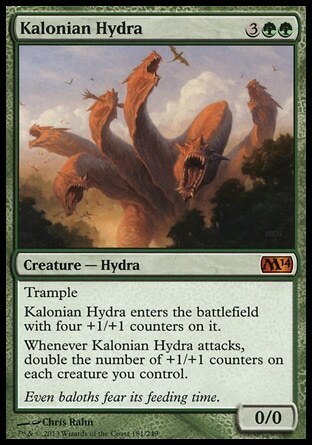 Kalonian Hydra: This one really doesn’t need much explanation. Doubling something that is doubling everything is never a bad time. If you can protect him with a little bit of counter magic you’ll be able to give everyone a lesson in exponents. The big challenge with standard is that we don’t really have creature tutoring available in G/U right now. The only way Simic is able to find key cards is by card draw. Fortunately, if the deck gets some momentum large amounts of cards can be drawn. Zegana: If you have a semi-large dude out, and you probably will, Zegana is going to replenish your hand quite quickly. 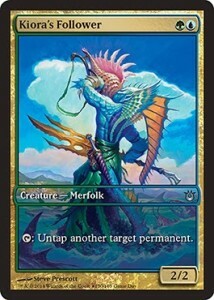 Fathom Mage: Go ahead and Bioshift all of those counters from your Zegana onto your Fathom Mage when you need to dig even further. 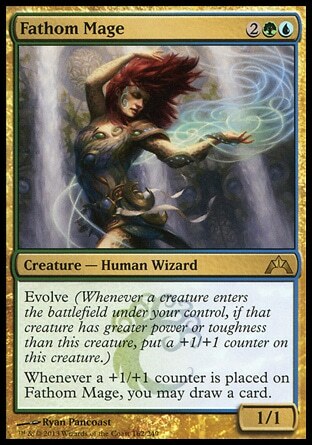 You can get some neat mini-engines going with Fathom Mage by using cards like Ooze Flux to pull counters off the mage and make oozes to evolve her again. 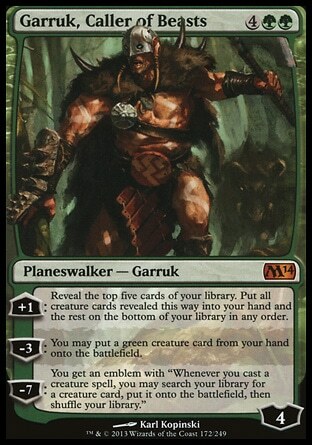 New Garruk: I don’t personally own this particular Garruk yet, but if you do, he is a great addition to the list providing a beefy walker that can dig through your deck for more creatures to fuel your simic experiments. 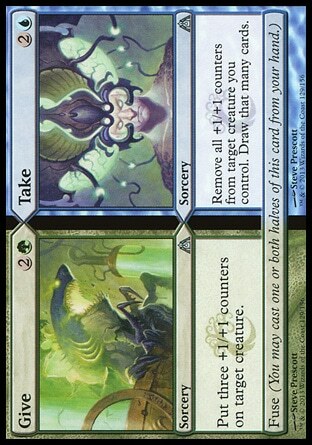 Give//Take: Give provides a great way to plop counters onto a creature early in the game, like Gyre Sage. Later, when you have a pile of counters on a creature, but need to refill your hand Take is a potent draw spell. Of course fusing them is twice the fun. If you decide to take the plunge and build a standard commander deck I have found there are some useful utility cards you should probably consider no matter who your general is. 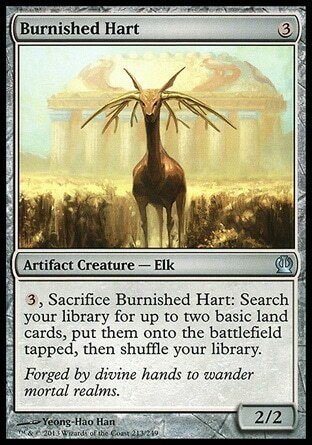 Burnished Hart: The big elk is handy to have in a regulator commander deck and he really shines in this format bringing mana ramp to any color or lets you just elk it up like a boss if you don’t want to sacrifice him right away. 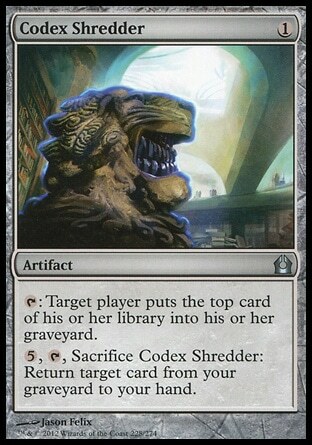 Codex Shredder: “What does that card do again?” is probably the first response most people will have to big daddy shred. It’s a handy effect that lets you return any card back to your hand in a format where there isn’t a wealth of recursion. It also lets you mill cards into your yard so you have more recursion targets to choose from. Official rating: surprisingly useful. Rogues Passage: The passage is a great way to jam damage through if the battlefield has gotten clogged. 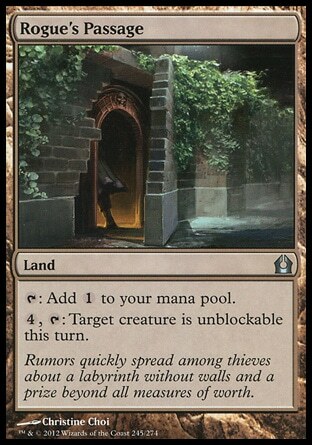 You aren’t going to be running many non basic lands, so the colorless mana is not going to be a problem for your mana base. It’s a great late game mana dump as well. By the time you read this you will most likely be on your way to a prerelease event to actually open and play with cards from the new set. Congratulations time traveler, but in the age when this article was written we fashioned crude dice using stone tools with our crinkled ape hands and sleeved cards in animal skins. It was many ages ago, long before Born of the Gods was released to the public. That is why I cannot speak about these cards from personal experience, but these BNG gems caught my eye during spoiler season as possible future inclusions into Vorel when the available card pool grows by 165 cards. Kiora: She is simic. She is a planeswalker. She should go into this deck. Kiora provides a great way to ramp and draw cards. You can also nullify a big threat on the table with her + ability. 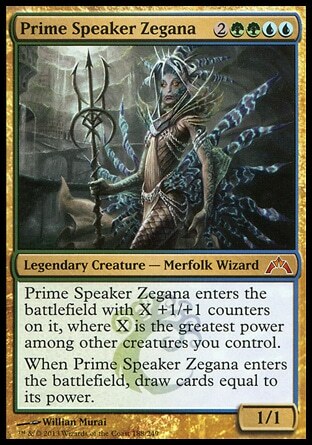 I’m not sure how powerful she is going to be in standard or in commander, but in standard commander she is totally playable. Nessian Wilds Ravager: I don’t know if I love the tribute mechanic. I think in most situations it should read, “if your opponent has a removal spell put X number of irrelevent +1/+1 counters on this creature, otherwise get a neat CIP effect. This tribute card should be good enough to play. 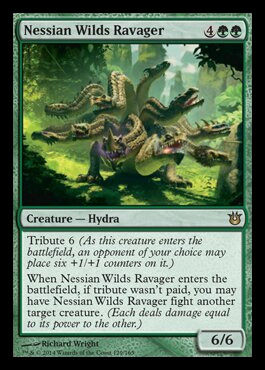 A 6/6 will pick of a large assortment of threats if you get to fight with it. Opponents will be more willing to let you get your CIP effect if they know you are primed to turn that 12/12 into an 18/18 with Vorel. Kiora’s Follower: This might actually be one of my favorite spoilers revealed so far. If nothing else, it’s a two drop mana dork. At it’s best the follower is going to let you untap Vorel for two activations in the same turn. Throw in Prophet of Kruphix and you are going to be doubling things like an insane person taking too many insane pills. What happens when standard rotates? Once the Return to Ravnica block rotates I lose my commander. That leaves me with a few options. I could pull the deck apart and use the pieces in other decks. 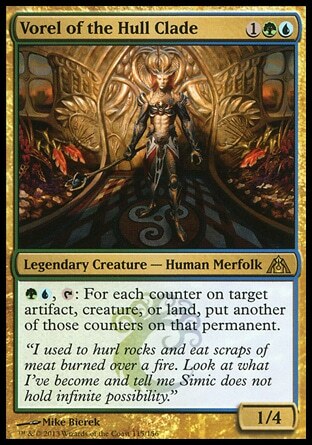 I could switch to a new commander and swap out all of my RTR cards for standard legal options. The most likely thing I’ll do at rotation is transfer it from a standard only deck to just a regular EDH list. With the all new fall block if I want to keep playing standard style, I’ll find a new commander to build around and start the process over again. There are some great additions you can make that will really enhance the deck. Cards like Darksteel Reactor can give you an all new win condition. The graft mechanic fits right into a deck built around +1/+1 counters as well. Doubling Season is always nutty and quadrupling counters with Vorel is sure to live up to its nutty reputation. Vigor gives the deck a way to protect creatures and pump out even more +1/+1 counters. So there you have it. If you are looking for an all new commander experience that uses easy to find cards with an pretty even playing field standard commander might be the deck building challenge you were looking for. What do you think of the format? Let me know in the comments below!